A blog gives the information about Total sanitation campaign and how t he sanitation goal can be achieved by us. The President of the Republic of India is the Head of State of India and the Commander-in-chief of the Indian Armed Forces. The President is indirectly elected by the people through elected members of both the houses of the Parliament of India, the Legislative Assemblies of all the states of India and the Legislative Assembly of the Union Territory of Puducherry, as well as, the Legislative Assembly of the National Capital Territory of Delhi and serves for a renewable term of five years. The oath of the President is taken in the presence of the Chief Justice of India, and in his/her absence, by the most senior judge of the Supreme Court of India. ..New Delhi, Nov. 14: Rural development minister Jairam Ramesh today described India as the "dirtiest and filthiest" country in the world where people with mobile phones go out to answer the "call of nature". The comment was the latest addition to the minister's repertoire of controversial statements on a gamut of subjects ranging from education and research to sport utility vehicles (SUVs) and sanitation. Ramesh, who last month said open defecation was a "blot" and a "shame", returned to the topic as he highlighted what he called a "paradox". "In one area in which India can claim success in the social sector is education. We can't say the same thing in health, we can't say the same thing in nutrition, we certainly can't say the same thing in sanitation because we do remain the dirtiest and filthiest country," he said. He said around 65 per cent of rural houses had been provided with toilets but didn't use them. "Today, if you go to many parts of India, you have women with a mobile phone going out to answer the call of nature. I mean it is paradoxical," the minister, who also holds charge of sanitation, said at an event here. "You have a mobile phone and you don't have a toilet. When you have a toilet, you don't use the toilet... (but) use it as a godown." Last month he had said it was a "blot" on India and a "shame" on everyone that the country had the highest rate of open defecation in the world. According to a WHO survey, Indians account for 58 per cent of the world's population practising open defecation. China is a distant second, accounting for about 7 per cent. The minister, who has sought an increased allocation to address the problem of open defecation, said the biggest challenge was how to educate people about sanitation and cleanliness. The Centre and states spend about Rs 2,400 crore a year on sanitation. While the Centre spends Rs 2,000 crore, the states contribute around Rs 400 crore. The ministry has decided to set up community toilets, which villages will maintain. As environment minister, Ramesh had said use of SUVs in a country like India was a crime. He said diesel was subsided primarily for farmers. Some of the costlier SUVs run on the poor man's fuel. At a convocation programme, Ramesh had taken off his robe, saying the gowns were a sign of "colonial slavery". Earlier this year, he had said there was "hardly any worthwhile research" in the IITs and that teachers in the tech schools were not "world-class". In Raina district, West Bengal, primary school children are acting as major change agents. They have been assigned the role of health soldiers. These health soldiers are asked to report any wrong practices with regard to hygiene behavior (e.g. not cleaning latrine after usage) which they may observe during the day, to the teacher. The children also identify the sanitation problems in the school premises and in the village, and make maps. Each week children and teachers check a number of hygiene and cleanliness habits or places in the school. These are entered on to a chart where progress can be seen as time goes by. The teachers tell stories and do activities with the children to help them understand the importance of sanitation. The teachers as well as the children demonstrate to the class different hygienic practices like washing hands, personal hygiene, etc. Further, to facilitate active hygiene practices to happen all over the village, there are various capacity building programmes for Guardian representatives, Village Water Committee members, panchayat members and anganwadi members. What is happening in Raina district is one of many examples of what is taking place all over the country as part of the School Water Supply, Sanitation and Hygiene Education (SSHE) effort under the Total Sanitation Campaign launched by Government of India. In Raina district, the programme has achieved 80 per cent target for water supply and 50 per cent target for latrines. Components of SSHE: The implementation of SSHE takes a holistic approach by recognizing that while availability of facilities is important, the students and teachers need also to be oriented towards better sanitary practices. To achieve this, the SSHE programme has a Hardware Component which is the total package of drinking water, hand-washing and sanitary facilities available in and around the school compound; and a Software Component which includes health and hygiene activities aiming to promote conditions at school and practices of staff and children, that help to prevent water and sanitation related diseases. 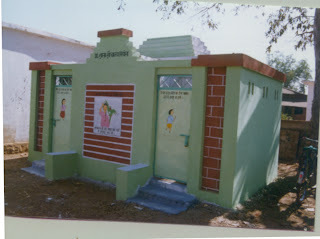 · Construction of toilets in all types of Government Schools i.e.ƒnPrimary, Upper Primary, Secondary and Higher Secondary. 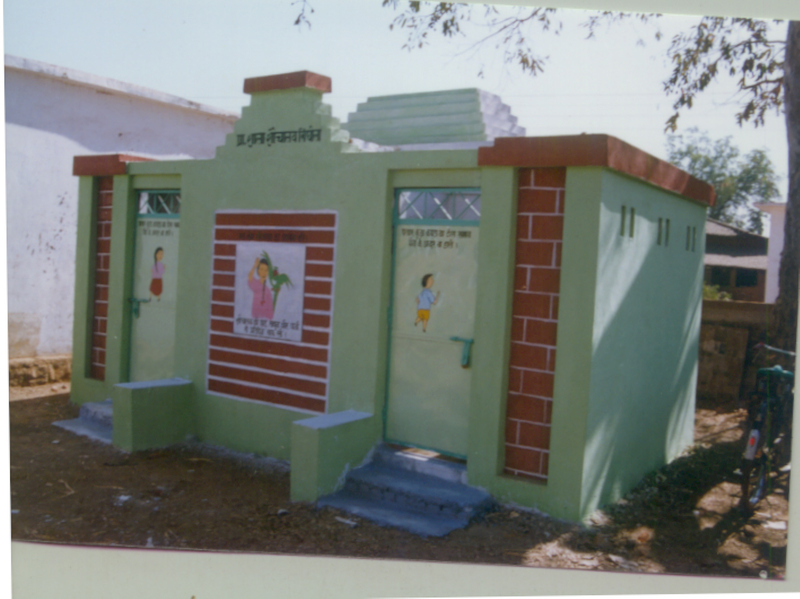 Emphasis is given on toilets for girls, along with a water storage tank and hand washing facilities. · Installation of hand pumps in schools for provision of drinking water, where at present there are no such sources. · Provision of other materials, for example buckets, mugs, soap tray, brush, drum for drinking water etc. · Construction of drainage system for solid and liquid waste disposal. · Construction of garbage pit, soakage pit, cooking storage place for food. · Plantations for neat and clean school compound and lighting, ventilation for clean classroom environment. · Baseline survey of the school: participatory needs assessment involving students, teachers, parents and community members.
. Inter-sectoral coordination: pooling of resources/ideas among departments. · Formulation of objectives, outputs/results and an action plan.
. School awareness/IEC: about School Water Supply, Sanitation and Hygiene and seeking participation. · Motivation of the school committee members, students and the public to improve the school environment with fencing, planting of trees and to maintain the sanitary block properly with their own contribution. · Organization of a campaign in the village through the school for adoption of water points, sanitary latrine, garbage pit, soakage pit, smokeless , water storage tank and other sanitary provisions in the household as a package. · Training and orientation of community and parent groups such as School Management Committees, PTA leaders, PRIs and teachers to train other frontline workers /NGOs/Masons/ Motivators etc. promoting sanitation and other activities in the community, making the primary school as a focal point. · Formation of school health clubs to discuss, take responsibility and participate in making provision of water and sanitation facilities in the schools as well as to maintain these facilities. · Health and Hygiene Education Activities among school children on use of water and toilets hand washing, safe disposal of waste, use of footwear, water and food handling. Total Sanitation Campaign is a comprehensive programme to ensure sanitation facilities in rural areas with broader goal to eradicate the practice of open defecation. TSC as a part of reform principles was initiated in 1999 when Central Rural Sanitation Programme was restructured making it demand driven and people centered. It follows a principle of “low to no subsidy” where a nominal subsidy in the form of incentive is given to rural poor households for construction of toilets. TSC gives strong emphasis on Information, Education and Communication (IEC), Capacity Building and Hygiene Education for effective behaviour change with involvement of PRIs, CBOs, and NGOs etc. The key intervention areas are Individual household latrines (IHHL), School Sanitation and Hygiene Education (SSHE), Community Sanitary Complex, Anganwadi toilets supported by Rural Sanitary Marts (RSMs) and Production Centers (PCs). The main goal of the GOI is to eradicate the practice of open defecation by 2010. To give fillip to this endeavor, GOI has launched Nirmal Gram Puraskar to recognize the efforts in terms of cash awards for fully covered PRIs and those individuals and institutions who have contributed significantly in ensuring full sanitation coverage in their area of operation. The project is being implemented in rural areas taking district as a unit of implementation. MUMBAI: Toilets in an Orissa village may not be the best place to spend your birthday in. But that's exactly what 50-year-old Jack Sim did this year on March 5. Known as Toiletman for promoting better sanitation across the world, Sim could not resist peeping into the country restrooms even as he was holidaying. And loo behold, the picture wasn’t pretty. "India has been exotic. although the toilets I don’t enjoy," Sim says, recalling his sojourns in several places across the country, besides Orissa. The man who had successfully run a campaign to make toilets in Singapore cleaner and spread the mission to many other countries, is now busy tying up partnerships to work the same magic in India. He will have his hands full. India and China, the rising economic powers, account for a fifth of the world’s 2.6 billion people who lack access to toilets. Public urination and defecation are part of the culture, even among the affluent. On the other hand, large slums and vast swathes of countrysides simply don’t have the infrastructure, leaving people to do the thing out in the open. Much of the incidence of water-borne diseases is traced to poor sanitation. Sim says he is struck by the notions prevalent in India. While even the poorest of people want to dress up well, they leave the toilets filthy, stinking and unusable by the next guy. “They want to look good, but why not the toilets?” he wonders. Here, the campaign has to first sell the idea of toilets; make them glamorous, even a status symbol. “I want to sell toilets like Gucci does its handbags and Rolex its watches,” he opens up. And that’s what he has done over the past decade as an international activist with a cistern-full of funny and innovative ideas. At 40, Sim gave up his flourishing construction business and founded the World Toilet Organisation (WTO). “I figured out that more than money, time was important. So, I decided that for the rest of my years I will spend doing something that I like,” he says. That happened after Goh Chok Tong, who was the then prime minister of Singapore, observed that the state of public restrooms was one way to measure social graciousness. The tiny city-state may now be a model of public hygiene, but those days, it had terrible toilets, he recounts. Although, Singapore had been running a clean public toilet campaign for over 20 years, the campaign had borne little result. So, inspired by the toilet associations in Japan, he decided to start his own movement to flush away Singapore’s foul toilet reputation. He established the Restroom Association of Singapore (RAS) in 1998. He also realised that while there were other toilet associations doing good work in Singapore, there was no channel to facilitate information sharing and gathering of resources. “There was a lack of synergy and I took on the task of connecting everybody together under one umbrella organisation,” he explains. That is how he founded the WTO in 2001. With only 15 members from Singapore, today, the organisation has members from 44 counties and has partnered with various financial institutions, including the ADB and UBS, for donating toilets. WASHINGTON: India has topped the list of top ten nations that lacks sanitary facilities. In an initiative to bring awareness to the need for adequate sanitary facilities, the "big squat" was held worldwide to coincide with the 10th annual World Toilet Day . Here's a list of the world's worst nations in terms of people lacking access to sanitary facilities, reports The Christian Science Monitor. 1. India: 638 million The world's second-most populous nation after China, India has the world's largest number of people going outdoors. Nearly 640 million Indians, or 54 percent of the 1.1 billion population lack access to toilets or other sanitation facilities. In some states, the problem was so bad that village women started a slogan: "No toilet, no bride." 2. Indonesia: 58 million About 58 million Indonesians, 26 percent of its population, don't use toilets. Southern Asia, home to 64 percent of the world's population that still uses the bathroom in the open, has seen the practice decrease the most - from 66 percent in 1990 to 44 percent in 2008. 3. China: 50 million China has 50 million citizens going in the open. That's only 4 percent of its 1.3 billion population. More than 267 million Chinese have gained access to improved sanitation since 1990, according to the WHO. As the Los Angeles Times recently found, China's surge in wealth is also causing a spike in toilet purchases. Nearly 19 million toilets are sold in China annually - double the number sold in America. And six percent of the urban population - compared to 2 percent of the rural population - go in the open, according the WHO's 2010 update on sanitation. 4. Ethiopia: 49 million Seven in 10 people in Ethiopia's rural areas don't use indoor toilets. The landlocked nation on the Horn of Africa has seen minimal progress over the past two decades in increasing sanitation access, with only 12 percent of the population gaining improved services. 5. Pakistan: 48 million Of Pakistan's 177 million people, about 48 million go where they please. But Pakistan has seen incredible gains over the past two decades, with 47 million people no longer defecating in the open, according to the WHO's 2010 update on progress on sanitation and drinking water. However, it saw setbacks recently with the massive flooding that displaced millions of people and worsened already poor sanitation conditions, as the Monitor reported. 6. Nigeria: 33 million Africa's most populous nation, Nigeria, also has the world's 6th highest number of citizens going to the bathroom outside. Of 151 million people living in Nigeria, 33 million do it in the open. Still, more than 12 million people there have gained access to sanitation facilities over the past two decades. 7. Sudan: 17 million More than 17 million people, or 41 percent of the population, in the northern African nation of Sudan use the outdoors as their bathrooms. 8. Nepal: 15 million The Himalayan nation wedged between India and China has low use of sanitation facilities, with some 52 percent of the 29 million population lacking access to indoor plumbing. Still, 31 percent of the population - or 6.8 million people - have seen improved sanitation facilities over the past two decades. 9. Brazil: 13 million About 13 million Brazilians go to the bathroom in the open, according to the WHO, although this is only about 7 percent of the nation's population of 192 million people. Over the past two decades, about 80 percent of the population saw an improvement in sanitation facilities, allowing more than 50 million people to gain access to better facilities. Across Latin America and the Caribbean, the percentage of the regional population openly defecating dropped from 17 percent in 1990 to 6 percent in 2008. 10. Niger: 12 million Four in 5 people in Niger go in the open, according to the World Health Organization (WHO). That's about 12 million people, or 79 percent of the 14.7 million population in the north-central African nation. It's a slight improvement from the 84 percent of the population who did their business in the open in 1990, according to the WHO's 2010 update on progress on improving sanitation. SANITATION IN INDIA : How Bad is It? reach 80%, up from 43% in 1990. In rural areas, the projection is 48%, an incredible improvement over the coverage rate of just 1% in 1990.2 In real numbers, that means more Indians will have improved their sanitation situation from 1990 to 2015 than the total number of people currently residing in the United States—quite an achievement. However, while India may be “on track” in achieving the MDG sanitation target, it is importantnot to be complacent. MDG goals simply represent achievable levels if countries commit the resources and power to accomplish them. They do not necessarily represent acceptable levels of service. This is especially true for India’s sanitation situation. Despite recent progress, access toimproved sanitation remains far lower in India compared to many other countries with similar, or even lower, per capita gross domestic product. Bangladesh, Mauritania, Mongolia, Nigeria, Pakistan, and Viet Nam—all with a lower gross domestic product per capita than India3—are just a few of the countries that achieved higher access to improved sanitation in 2006.4 An estimated 55% of all Indians, or close to 600 million people, still do not have access to any kind of toilet.5 Among those who make up this shocking total, Indians who live in urban slums and rural environments are affected the most. In rural areas, the scale of the problem is particularly daunting, as 74% of the rural population still defecates in the open.6 In these environments, cash income is very low and the idea of building a facility for defecation in or near the house may not seem natural. And where facilities exist, they are often inadequate. The sanitation landscape in India is still littered with 13 million unsanitary bucket latrines, which require scavengers to conduct house-to-house excreta collection. Over 700,000 Indians still make their living this way.7 The situation in urban areas is not as critical in terms of scale, but the sanitation problems in crowded environments are typically more serious and immediate. In these areas, the main challenge is to ensure safe environmental sanitation. Even in areas where households have toilets, the contents of bucket-latrines and pits, even of sewers, are often emptied without regard for environmental and health considerations. U R Honourable visitor No.